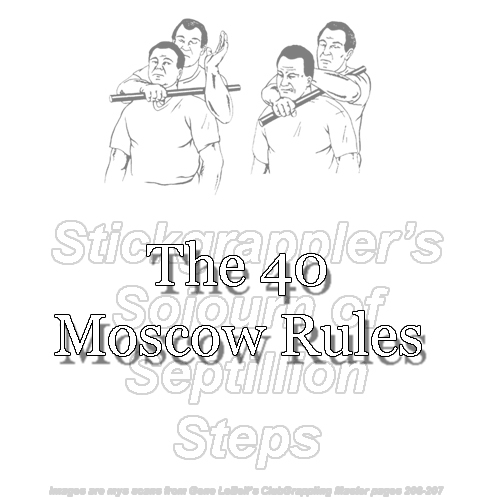 The "Moscow Rules" were developed by the CIA and named after Moscow which was a dangerous place to be during the Cold War. One may think of them like “Rules of Engagement” for spies, although it could also serve as guidelines or rules of thumb for one's self-defense. If you haven't any Rules of Engagement for yourself, start thinking of them now and not while you are in the Moment of Truth as the 'fit hits the shan'! Hope these help in your Sojourn of Septillion Steps! Rule #2: Technology will always let you down. Rule #3: Murphy is right. Rule #4: Never go against your gut. Rule #5: Always listen to your gut; it is your operational antennae. Rule #6: Everyone is potentially under opposition control. Rule #7: Don’t look back; you are never completely alone. Use your gut. Rule #8: Go with the flow; use the terrain. Rule #9: Take the natural break of traffic. Rule #10: Maintain a natural pace. Rule #11: Establish a distinctive and dynamic profile and pattern. Rule #12: Stay consistent over time. Rule #13: Vary your pattern and stay within your profile. Rule #14: Be non threatening: keep them relaxed; mesmerize! Rule #15: Lull them into a sense of complacency. Rule #16: Know the opposition and their terrain intimately. Rule #17: Build in opportunity but use it sparingly. Rule #18: Don’t harass the opposition. Rule #19: Make sure they can anticipate your destination. Rule #20: Pick the time and place for action. Rule #21: Any operation can be aborted; if it feels wrong, then it is wrong. Rule #22: Keep your options open. Rule #23: If your gut says to act, overwhelm their senses. Rule #24: Use misdirection, illusion, and deception. Rule #25: Hide small operative motions in larger non threatening motions. Rule #26: Float like a butterfly; sting like bee. Rule #27: When free, In Obscura, immediately change direction and leave the area. Rule #28: Break your trail and blend into the local scene. Rule #29: Execute a surveillance detection run designed to draw them out over time. Rule #30: Once is an accident; twice is a coincidence; three times is an enemy action. Rule #31: Avoid static lookouts; stay away from chokepoints where they can reacquire you. Rule #32: Select a meeting site so you can overlook the scene. Rule #33: Keep any asset separated from you by time and distance until it is time. Rule #34: If the asset has surveillance, then the operation has gone bad. Rule #35: Only approach the site when you are sure it is clean. Rule #36: After the meeting or act is done, “close the loop” at a logical cover destination. Rule #37: Be aware of surveillance’s time tolerance so they aren’t forced to raise an alert. Rule #38: If an alert is issued, they must pay a price and so must you. Rule #39: Let them believe they lost you; act innocent. Rule #40: There is no limit to a human being’s ability to rationalize the truth.